Thank you for making a pledge to Footlight Club Fire Safety Systems. We will notify you by email when the fundraiser is launched! The Footlight Club has an urgent mandate from the Boston Fire Department to upgrade our fire alarm and fire suppression systems. to endorse Mary O'Donnell's fundraiser for The Footlight Club. Amazing news: The Massachusetts Cultural Council has awarded a grant of $90,000 so that The Footlight Club can replace its fire alarm and fire suppression systems! BUT...we need to raise $90,000 to match that grant. Our project is anticipated to cost $186,000 and we need your help! With this grant, we have raised more than $160,000 for this project to date, and we need your help to raise the final $26,000 to get the project started. The Footlight Club in Jamaica Plain, America's oldest community theater, has been in continuous operation since 1877, producing plays and serving the community in our home, historic Eliot Hall. As a nonprofit, we are run completely by volunteers who maintain our beautiful building and raise funds to sustain it for the future. If you've enjoyed a night of theater or a community event in Eliot Hall, you know what an amazing piece of history we have. Right now you can double your impact because a wonderfully generous anonymous donor has offered to match every dollar you give--up to $30,000! Every dollar counts, and we appreciate anything you can give. And check out our upcoming productions at www.footlight.org. Thank you! Raised of a $30,000 goal. The Footlight Club stages great shows every year and has done for well over 100 years. Their high-quality productions that are often nominated for awards. The Club has a special welcoming feel to it and is truly community-based. The building in which it operates is a treasure. It would be a very great pity to lose this Jamaica Plain jewel because of a change in fire regulations. I have seen many productions there since 2010 and I hope to continue doing that for a long time. Endorse Mary O'Donnell's fundraiser for The Footlight Club. Log In or Create An Account to endorse Mary O'Donnell's fundraiser for The Footlight Club. 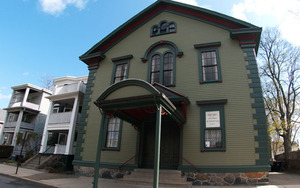 Nestled in a residential area near Jamaica Pond, The Footlight Club is America's oldest community theatre, performing every year since 1877. For over a century Footlight Club members have sustained the organization's mission: To present the best in non-professional theater to a broad-based audience, and to preserve and maintain historic Eliot Hall as a community resource. Pledge to "Footlight Club Fire Safety Systems"
Donate to "Footlight Club Fire Safety Systems"